We saw in TPart 1 how the Track Artist provided by MusicBrainz is great for Pop/Rock music but not for Classical music and in Part 3: we see how the standard metadata specification is somewhat lacking for Classical music. Once a track is defined as being Classical the Classical options within SongKong come into effect. The MusicBrainz Track Artist option allows you to configure from a number of different options, the default is Performers and Choir/Orchestra/Ensemble and Conductor - note the Composer is not included. SongKong then builds this track artist by looking at the Track Artist Credits, Recording Artist Credits, Release Artist Advanced Relationships and Recording Artist Advanced relationships. It also does additional text based analysis, to take a very simplistic example if there is artist credit containing the word Orchestra in the title then that artist would be considered to be an orchestra even if there is no performing orchestra advanced relationship for this track. Another example is that we have identified over 3000 Classical composers that died before 1900, we can be mostly sure that if one of these artists is credited on a track that their role was composer rather than performer even if there is no composer credit listed. The data is not always complete but by using the above techniques we can usually create a track artist credit that matches the option chosen. In Pop/Rock music there is usually a single performer or band who is credited for the track. They are often the composer of the song as well but when they are not the details of the writer are not usually so important, the artist credits on the release itself make it clear who should be credited for each track. For example 19 the first album by Adele contains mainly songs written by Adele, but track 9 Make You Feel My Love is a cover of a Bob Dylan song, and the main composer of track 3 Chasing Pavements is Ed White. However the Track Artist for all songs is Adele. But in Classical music, various performers, an orchestra, a conductor and a composer are all usually credited, this means there is potentially a long list of people credited for each track, and we don’t have an accepted order they should be added in. 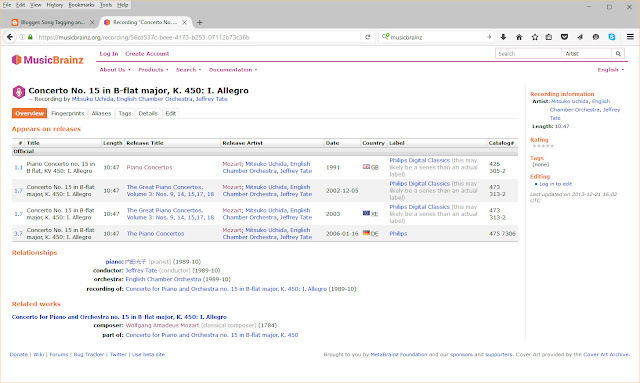 MusicBrainz approach is to store the Composer in the Track Artist field as can be seen in the release of Piano Concertos whereby all songs are credited to Mozart. However the the actual performers of each track such as this one are stored in the Recording Artist field, and as relationships between the recording and various people involved. In the Part 2 we explain how SongKong uses a more sensible value for Track Artist in Classical music. The main focus of this release is support for Classical Music tagging. Classical Music has never been as well supported in taggers, players or indeed any aspect of recording music as Popular Music but with this version of SongKong we aim to address that. 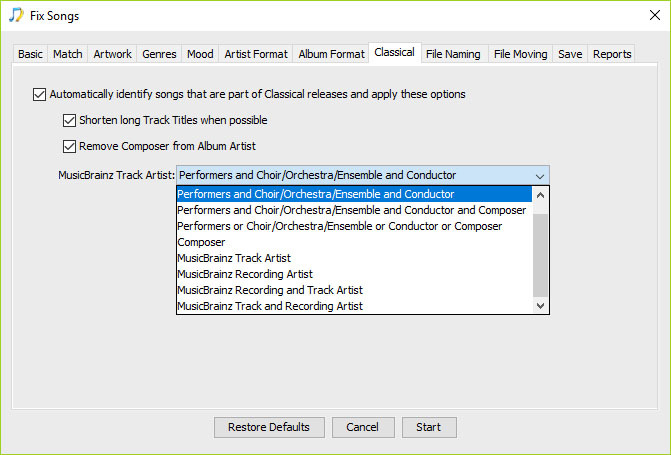 When identified instead of just using the composer as the track artist by default it now adds the performers, orchestra and conductor, but you can configure to keep on using composer if you wish. Performers are added with their instruments, with additional fields to indicate if they are credited soloists or not. We also make some general matching improvements. We also provide a linux version that can be installed when you only have a command line and no gui (also known as a headless server). SongKong has always had the ability to be run from the command line but previously the installer itself needed a Gui.